LOS ANGELES, CA, December 7, 2016 – Seventh Street Development and Cushman & Wakefield joined officials from the City of Irwindale and the City of Baldwin Park on December 6, 2016 to celebrate the groundbreaking of Alderson Business Park, a 10-acre, 195,130-square-foot industrial development in Irwindale, California. It is one of only two speculative industrial developments in Irwindale in the last 10 years. 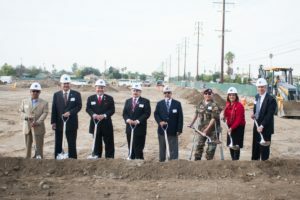 The groundbreaking ceremony comes after nearly two years of effort by the City of Irwindale and Seventh Street Development, a privately held real estate development firm that has been a member of the Irwindale Chamber of Commerce for 12 years. Dignitaries presiding over the Tuesday morning ceremony were: Irwindale Mayor Mark Breceda; Irwindale Mayor Pro Tem Albert Ambriz; Irwindale Councilmember Manuel Garcia; Irwindale Councilmember Manuel Ortiz; Irwindale Councilmember Larry Burrola; Baldwin Park Councilmember Cruz Baca; Baldwin Park Councilmember Ricardo Pacheco; Irwindale Planning Commissioner Patricia Gonzales; Irwindale City Manager John Davidson; Baldwin Park Chief Executive Shannon Yauchzee; Irwindale Community Development Director Gus Romo; Team AMVETS of California Department Commander Enrique Rudino, and American Veterans Post 113 Commander Jerry Martinez. On the eve of the 75th anniversary of the Pearl Harbor attack, the ceremony was also attended by a large number of Veterans including four that served in WWII. The Alderson Business Park site is located on Alderson Avenue and Los Angeles Street immediately adjacent to American Veterans (AMVETS) Post 113 Headquarters and Event Center, a 600-member post that has been operating for 57 years. AMVETS had been leasing their 2.33-acre property from the City of Irwindale Redevelopment Agency (RDA). When the State of California required the RDA to sell all of its properties and AMVETS was in danger of losing their lease, an entity controlled by Seventh Street Development made a donation of $2.5 million to the AMVETS California Charities which ultimately allowed Post 113 to purchase their headquarters facility. The state-of-the-art industrial complex featuring Mission-style architecture will be comprised of five freestanding buildings that range from 28,420 to 49,380 square feet and is scheduled for completion in June 2017, with spaces available for lease. Each building will feature 5,570 square feet of two-story executive office, large fenced private yards, 26-foot minimum clear height, dock-high and grade level loading, ESFR sprinkler systems, and ample parking. The project is optimally situated on the Irwindale/Baldwin Park border within close proximity to the Baldwin Park Metrolink Station/Bus Center and the I-605, I-10, and I-210 Freeways. Seventh Street Development has been the most active industrial developer in the San Gabriel Valley in recent years, having completed projects such as the 85,000-square-foot Speedway Business Park (a previous speculative industrial development in Irwindale), the 650,000-square-foot Huy Fong Foods headquarters and manufacturing plant (the largest single building ever built in Irwindale), and the four-phase 2,000,000-square-foot Mission 71 Business Park in Pomona.